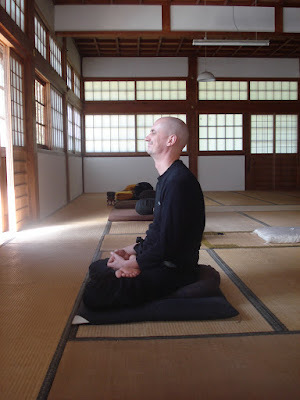 It is already more than 30 months ago now that I started to discuss the question of how to cross the legs during zazen. I kind of reached a conclusion one year ago. The next point will be the pelvis/hip/waist area which in Japanese is called "koshi". It is written with the Chinese character shown on the left. The left half of the character, a so called radical, means "flesh" or "meat", while the right side means "important" or "essential point". 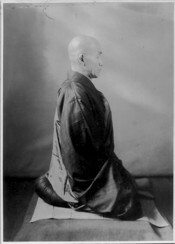 Therefore Sawaki Roshi says that the essential point in the human body is the hip region (koshi). 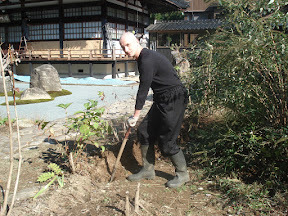 In this article I would like to discuss the importance of the hips for the zazen posture and other aspects of practice. Related is the topic of the zafu, our sitting cushion. Before I start: There is an excellent article about Getting into Lotus-Western Style over at Al Coleman's blog called Hey Bro! Can You Spare Some Change?. I highly recommend it. 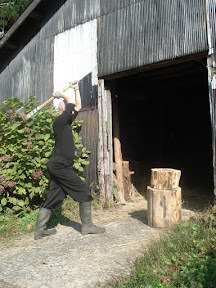 The article also concentrates on the importance of the hips. 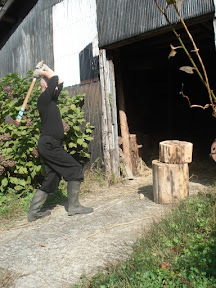 Make sure that your hips are always bend forward and your consciousness sharp and clear. 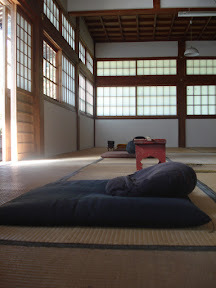 Don't forget that the vital point of zazen lies in the hip/waist/pelvis area." Why, one might ask, should we use only one half of the cushion? Why not sit on the whole cushion? And what exactly is the right height of a zafu? Why should the knees be "attached like sheels" to the sitting mat under the cushion? And why the emphasis on the constant bending forward of the hips? The answer is simply that we try to sit with a stable physical posture, and to support our body we have the triangle formed by our buttocks and both knees. If I sit on the whole cushion (say the donut-shaped Kitty-chan cushion on the left), my knees will befloating in the air. 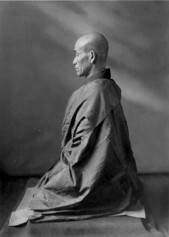 By placing only the buttocks on one edge of the cushion, the knees can rest more firmly on the mat below, or on the tatatmi. While the gravitational center of my body will never be in the exact center of the triangle, it must at least be somewhere inside the triangle. This will be the case when I bend the hips forward. 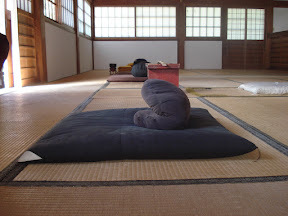 If the hips are bend backwards, on the other hand, my whole weight will rest only on my buttocks on the cushion, my knees will tend to float in the air again, and neither will my physical posture be stable nor will my mind be present in the act of sitting here and now. It will float somewhere. How high should the zafu be? The answer depends of course on the person. You have to find out by yourself. In my case, it also depends on if I am sitting in full or half lotus. This Kitty-donut for example is pretty low, but when sitting in a full lotus posture it serves me just right. 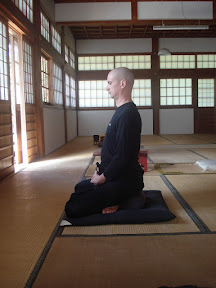 In the beginning of my zazen practice though, it seemed if I just could not sit high enough. The higher the better, I thought. Often I would place two zafus on top of each other. This "tower" of zafus would be quite unstable though. Later I discovered that I could sit high and stable at the same time by tying a belt around the zafu, as seen on the left. Whenever I sat through a zafu though, and tried a lower one instead, I discovered that it felt better with the lower one. And the one I am using right now is pretty low when I sit on it, because there is not much kapok stuffed inside. 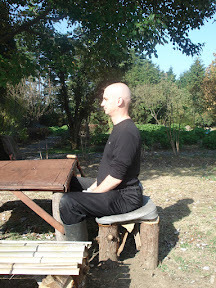 This is myself sitting in the full lotus posture. On the right you see the zafu after the sitting. 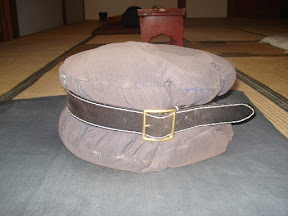 Of course, after sitting I press it to get it fluffy and ready for the next sitting after zazen. 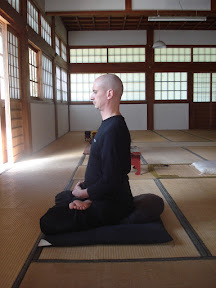 When I sit in half lotus though, I need a completely different height for the zafu, because if I sat with the same height I am using for full lotus, my lower leg would have problems circulating the blood. 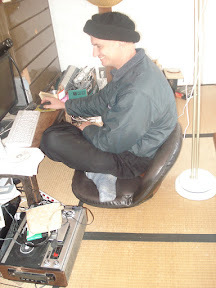 Here I am sitting in half lotus, on the same zafu. How do I adjust the height without changing zafus? I simply fold the zafu into two! How should the posture definitely not look like? If you do not bend the hips forward, it will - in an extreme case - look like this. You might experience less pain in the hips and legs, but you are also less "present". Or at least that is my experience. Let us compare some situations where the hips are both bend forward and bend backward. In Japanese one would say "koshi ga haitteiru" (the hips are "in") and "koshi ga nuketeiru" (the hips are "out/lost"). 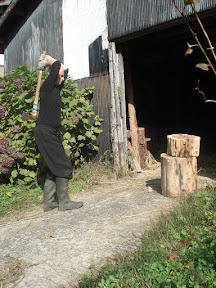 Here my wife demonstrates for us what "koshi ga haitteiru" means. Her hips are "in". While my hips are "out" or "lost" while typing this on the computer. 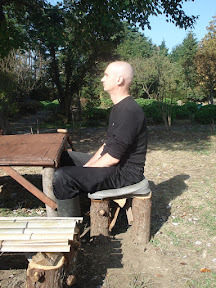 Again myself in a sitting posture, this time at a table. Here as well, it makes a clear difference how you hold your hips. But posture is not only important when sitting. 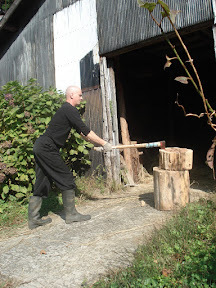 It can be even more crucial when doing physical labor or sports. 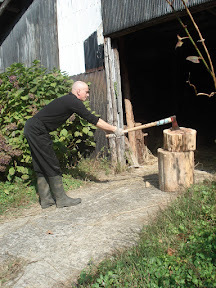 Working with a spade, with hips "in" and "out". 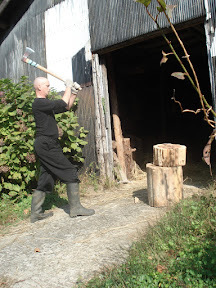 Chopping wood, using the hips bend forward. 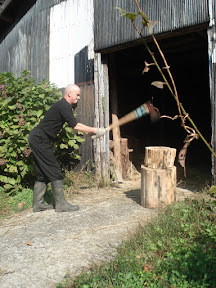 Chopping wood again, this time without the hips. Without using the hips, you have less power. 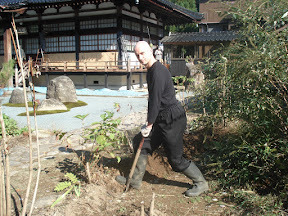 I will continue to write a little more about the hips next time: Their role in Japanese martial arts for example, or the lack of amphasis on the hips that I find in other Buddhist traditions.